For January bulletin board ideas the board could display a few Welcome Back messages after the New Year as well as an individual and department-wise resolution or two for the brand new year. Bulletin board themes could include a white snow theme. All the snap shots and articles could be displayed on tiny white snowflakes. Bulletin board decorating ideas for the January board could also include an employee recognition month, where thank-you notes from the year that has passed from clients can be posted. Bulletin boards are ideal workplace communication tools, methods and techniques for making the staff feel important and part of the team when they are acknowledged for the work they do. There are other effective ways to make staff stop and take note of your boards! Fill the board with unusual signs. You can find a lot on the internet and co-workers could have photos to borrow or copy. The border would be stop signs and yield signs and curves ahead, etc. The title at the top would be "Crazy Signs". Some of them may just be interesting. You'll be surprised how these will put a few smiles on faces. You can make the billboard background look like a road going off into the distance and across a desert etc., but depending on how many signs you end up with the back ground may not be visible enough to do that much work. Use a yellow or white background. Everyone needs a laugh! Cut out plain t-shirts from construction paper or similar substance and put crazy sayings from co-workers, internet, movies, etc. on to these shirts. Surround the border with cut-outs of laughing mouths and smiles. Good choices for the title at the top could include: "Funny T-shirts or Funny Tees". 3. Influence January bulletin board! This is the more serious side that affects workers more than theyknow. We all know we have to be a good influence to children, even though famous singers, athletes and other stars don't always promote that. You could put up pictures of people from magazines and have them saying things such as, "My! Your hair looks good today! ", "Let's be quiet, Joan is still on the phone with a customer" and "Here, let me help you with that," etc. How we treat others in the workplace, no matter how small the pleasantries, is necessary and does make a difference. According to one's office many other ideas pop into the minds according to the personalities that make up the office. You could name this bulletin "Influence" or even "Role Model". This is very close to consideration, but leans more towards being a role model in the office place. 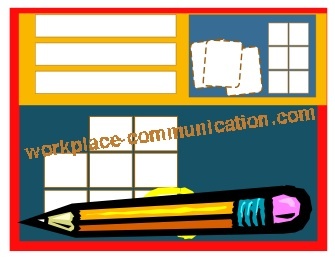 Make the background orange and place office items around the board such as pencils, pc's, staplers and the like, since this is a direct message to the office itself. 4. America's Flags January bulletin board! A white or dark blue background would be good here. Display all the flags that have made up the one we have today. It started with Betsy Ross' design, but does everyone know what it really looked like? How it changed and what the colors mean? Of course, display hand-made flags or cloth flags if you can find them and border with red, white and blue crepe paper. Call this one "America's Flags" or something similar. Whether it is "global warming" or too much emission or something else, we are having stranger weather than ever. People that have never seen a tornado, tsunami or earthquake are seeing these things in their lifetime. This would involve displaying some good pictures of tornadoes and hurricanes in action, earthquake and tsunami damage, hail damage, etc., then dating the times of these extreme occurrences. It wouldn't hurt to add safety instructions for anyone being caught in these types of situations. For instance, in tornadoes you would want to seek shelter outside of a car or mobile home since they will not last in a tornado. Then, around the edges of the border put lightning bolts, raindrops, umbrellas, etc. The title can be "Diverse Weather" or "Weather Safety". One can also eliminate earthquakes as weather, but if it is a high risk in your area you could re-post the precautions anyway. 6. America's Allies January bulletin board! Do we really know who our friends and enemies are? How many people in the office place could list all of our country's allies? Start with a black background. Next, it would be great to display the flags of the countries that are our allies then label the country and how long they have been our ally. It's important to really know what is going on in our country and its history. Display the outline of the USA for the border or if you want to get fancy cut out every state and place around the border.